Global warming alarmist scientists like claiming that the well documented Medieval Warm Period (MWP) was merely a regional phenomenon, and not global. However a new publication by Lüning et al adds yet another study that shows the warm period from 1000 years ago was indeed global. The climate of the Middle Ages is still a mystery. In many parts of the world a warming period occurred, which can still not be satisfactorily simulated by the current climate models. The problem: natural climate factors play almost no role in the models. It is therefore all the more important to first carry out a proper mapping of the climate for this important period. A research group led by Sebastian Lüning has presented an overview of the medieval climate in South America and now appears in the journal Quaternary International. Here the scientists summarized a large number of case studies of the entire continent. The climate archives included pollen surveys in lake sediments of the Andes, which documented the rise and drop of the tree line. Other studies reconstructed the oscillating shrinking and growth of Andean glaciers or dealt with tree rings. As a result, Lüning and his team found that the vast majority of the 76 individual studies indicate warming during the early 2nd millennium. The Medieval Warm Period was also strongly represented in South America. Exceptions were some coastal waters, where increased buoyancy of cold water led to a cooling. 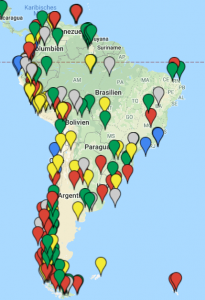 The mapping of the South American climate is part of a wider global study on medieval climate change. The project was kindly supported by crowdfunding during the launch phase. Here all published climate reconstructions are first collected on a Google Map and then plotted and compared in detail. In the appendix of the regional syntheses, each individual location is precisely evaluated and the resulting climate changes are discussed. The studies benefit from the great willingness by a large number of paleoclimatologists to cooperate and who readily provide their data for evaluation and discuss technical questions with the authors of the syntheses. Great thanks to everyone involved! As any half-decent scientist would say- scientific knowledge is always provisional, science is never settled. but still because of science only world balance exists and innovations are being done. Logically if it is accepted that the MWP was a local effect then it must be accepted that proxy data applies to the area from which the proxy came.